Pneumatic Cylinders also known as air cylinders are mechanical devices use the power of compressed gas to produce a force in a reciprocating linear motion. 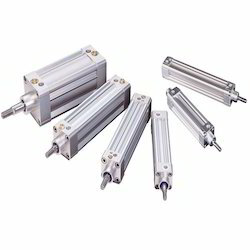 We offer a complete range of Pneumatic Cylinders that include Standard Construction Cylinders, ISO Cylinders, Special Cylinders, something forces a piston to move in the desired direction. The piston is a disc or cylinder, and the piston rod transfers the force it develops to the object to be moved. Engineers prefer to use pneumatics sometime because they are quieter, cleaner, and do not require large amounts of space for fluid storage. Because the operating fluid is a gas, leakage from a pneumatic cylinder will not drip out and contaminate the surroundings, making pneumatics more desirable where cleanliness is a requirement. For example, in the mechanical puppets of the Disney Tiki Room, pneumatics is used to prevent fluid from dripping onto people below the puppets. 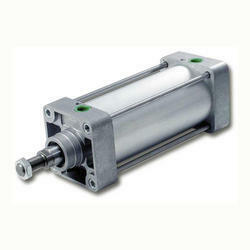 Manufacturers and Suppliers of High Quality Pneumatic Cylinders. Our original cylinders with thousands sold over the more than two decades that we have been manufacturing them. If you have any special requirement for which you want a cylinders designed we can help you. a) Standard Pneumatic Cylinders: Our "original" cylinder with thousands sold over the more than two decades that we have been manufacturing them. These have CI end covers and MS honed and hard chrome plated tubes. b) ISO Cylinders: A comparatively recent addition to our product line. These have Aluminum die-cast end covers and Aluminum tubes. c) Special Cylinders: If you have any special requirement for which you want a cylinder designed we can help you. We offer a complete range of Standard Pneumatic Cylinders that include:Standard Pneumatic Cylinders, ISO Cylinders, Special Cylinders, hydraulic cylinders, something forces a piston to move in the desired direction. The piston is a disc or cylinder, and the piston rod transfers the force it develops to the object to be moved. Engineers prefer to use pneumatics sometime because they are quieter, cleaner, and do not require large amounts of space for fluid storage. for bores of 65, 75, 100, 125, 150, 200, 250 and 300 mm seamless honed & hard chrome plated steel tube is used. Piston Rod: High tensile steel, Ground & hard chrome plated. End cover & piston: Close grained cast iron. Pneumatic Cylinders are made as per ISO pneumatic cylinders 6431 standards. ISO Pneumatic Cylinders are available in Bore size starting from 32mm and with all types of ISO Pneumatic Cylinders mountings.